Valken Tactical 0.20g BBs deliver exactly what airsoft veterans know and love about the Valken brand – unrelenting performance. Their laser accuracy and never-jam feeding consistency is only trumped by their seamless manufacturing process and picture perfect polish. Proving to be a top contender among the 0.20g BB weight class, Valken Tactical have cemented their intention to be crowned “The Best” among a rich tapestry of competitors, many of which fighting tooth and nail to catch up. 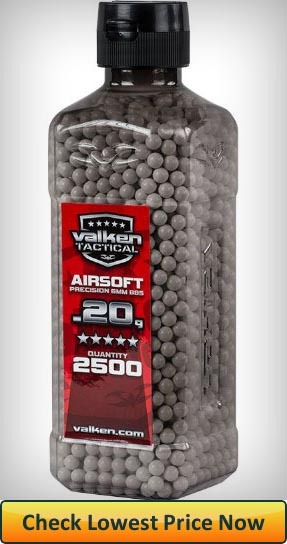 While 0.20g pellets are merely an entry level airsoft AEG ammunition – Valken Tactical 0.20g BBs have shown up ready to take the reigns in the race to airsoft ammo stardom. 0.20g BBs are one of the most common and popular weight classes in airsoft. Useful for both more advanced gas pistols, beginner AEGs as well as for stock snipers. 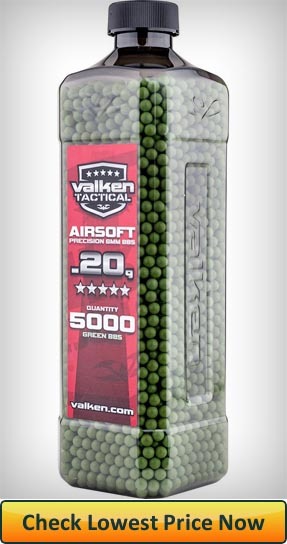 Valken BBs will perform best when used in guns performing in the 280-350 FPS range. While many mid-range airsoft rifles may benefit from a 0.25g BB, most beginner stock guns sold on the market today come with a power output that is most suited for a 0.20g pellets. While some lower end pistols might be a tad too weak, most average pistols should easily handle Valken BBs. Many stock and untouched snipers handle this ammo very well and will offer a lot of fun filled target practice hours. 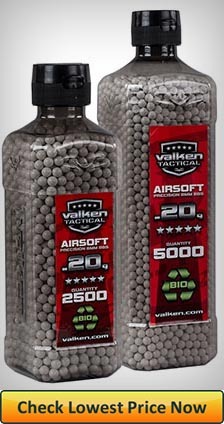 Valken Tactical 0.20g BBs represent the entry level pellet weight for AEG airsoft ammunition. They are white (or green) in color and come in two different quantities; 2500 (1.2lbs) count and 5000 count (2.2lbs). As for diameter, they measure in at 5.95mm, with a minuscule tolerance of +/- 0.01. The pellets are polished and seamless. Valken BBs come in a sturdy bottle with a flip-top cap and a crescent moon spout opening, which makes for easier Hi-Cap magazine loading. It becomes apparent just how fiercely competitive the 0.20g BB landscape is, when Valken show up with such a well designed product. From the pristine white color to the complete lack of seams to the consistent and shiny polish. This very lack of imperfections and deformities is the main contributor to their flawless performance on the battlefield. When it comes to BBs, jams and feeding issues are very easily explained; caused by sloppy and negligent manufacturing. The vast majority of Valken 0.20g BBs don’t show a hint of any such issues. Those that do are far and few between. I estimate that only around 3%-5% of all Valken BBs have lack perfection. Well within a reasonable margin of error. I do experience a recurring problem with Valken, albeit minute and of little consequence. It has to do with the well intended flip-top cap. While its design noticeably improves the ease of magazine loading, it’s very fragile and breaks easily. Having to be extra delicate with the cap is a bit frustrating at times, but a small price to pay for an overall well engineered product. Valken’s systematic and thought-out approach to manufacturing has payed of in spades by creating all in all one of the best crafted 0.20g BBs. Continuing the trend of “Ivy League” performance, Valken Tactical 0.20g BBs fly very stable and in a straight pattern for their weight. While I’m admittedly more versed with 0.25g-0.30g BBs, over the course of my airsoft life I have probably shot a good 25,000 pellets of Valken 0.20g ammo. To be let down is something I have stopped fearing from Valken. Which says a lot in the airsoft world, one of constant overpromise and underdelivery. Trust in consistent accuracy from BB to BB and bottle to bottle is rare, but V-Tac have earned it. I would take these BBs into competitive battle without thinking twice about it. In fact, I used to always carry a spare bottle of the 2.5k size with me to all airsoft meets and I constantly converted beginners to buying Valken exclusively. For sure one of the straightest shooting 0.20g BBs out there. I’d like to note that, while 0.20g pellets are much more stable than 0.12g, they are still a relative light pellet and will be affected by weather conditions. Don’t expect them to perform to their fullest potential in unwelcoming weather conditions. Gusts of wind will alter their flight pattern. Indoors and in CQB, they perform brilliantly. Also available in green. Click the button above to check the lowest price. Unsurprisingly, a well designed and well crafted product will prove durable. And so it is. Over my estimated 25k fired shots, I’ve never once had an issue with BBs shattering inside my gun or at impact. I actually once tried reusing Valken BBs to put their structural integrity to the test. I had no feeding issues or jams whatsoever. Please, do not try this at home. I merely wanted to prove a point. Remember, there are very good reasons why we never reuse BBs! When it comes to durability all I can say is A for effort and A for execution! You would think you will be paying an arm and a leg for such an awesome product. Nothing could be further from the truth. This is such a huge deal for me. I play airsoft to have fun, not to feel robbed every time I want to buy small plastic balls. Valken have answered my prayers. An awesome product for an awesome price. In fact, Valken come in as one of the most affordable BBs in their class. I would usually pick up several bottles at a time, it’s just such a steal. If you’re a budget orientated airsoft player, worry not – Valken’s pricing loves you just as much as you will love their ammunition. Valken Tactical 0.20g BBs are a brilliantly crafted and consistently performing workhorse. As accurate as it gets, strong and sturdy and more affordable than most of their competitors. For those in need of high quality 0.20g BBs, a total no-brainer buy. Have you used Valken Tactical’s 0.20g BBs? If so, make sure to praise them in the comment below and if not – leave a comment with any questions you may have. I’ll make sure to respond as soon as I can! Shortly after writing this product review I got word that Valken has changed factories from Taiwan to China due to their original factory being unable to handle the huge demand. During the transition, some of their produced BBs haven’t met the high standards we’re used to. It does seem like the quality is trending upwards now and I believe this issue is largely resolved. Still, just in case, Valken offer a full warranty on their BBs, if you’re having issues with your bottle contact them and you’ll receive a new one free of charge.